Being an extra nutrition, crunch and flavor to any meal, walnuts are harvested in autumn, yet they are available all year round. These super useful nuts are a wide source of omega-3 fatty acids. There are a number of species of their trees, while the most widespread type is the English one. It has originated in India and near the Caspian Sea, that’s why it is often called Persian walnut. As a food it is used in snacks, baking and salads. The nut shell and leaf are used to make medicine as well. They contain chemicals called fatty acids that are able to expand blood vessels, improve circulation, etc. They are used for lowering cholesterol, blood poisoning, digestive tract swelling, diarrhea, intestinal worms, skin diseases and infections, acne, eczema and so on. Almond is another type of seeds that obtains numerous health benefits. It is off-white in color and encased in a hard shell. Generally there are two types of almond: sweet and bitter. Of course we consume the sweet one. Bitter ones are used to make oil as a flavoring agent for foods and drinks like Amaretto. They are not edible, as contain hydrocyanic acid, which is a toxic substance and is removed while manufacturing. They are used in medicine as a mild laxative, remedy for various types of cancer, uterus and so on. They are available all year round, but the best season to enjoy them in the fresh form is mid-summer. These seeds are coming from ancient times and they are remembered even in the Bible. Romans called it “Greek nut”, but they are supposed to have originated in western Asia and North Africa. When looking at these seeds from the standpoint of minerals comparison, then almonds are the super ones high in numerous useful elements. 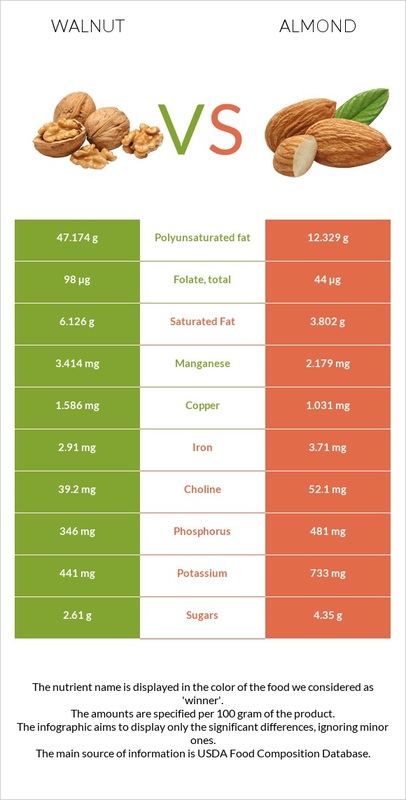 It is enough to mention that they are a wide source of Magnesium, Phosphorus, Iron, Calcium (all calculations are based on per 300gr), etc, which is radically higher than the other one. Walnuts contain 4 times more Vitamin B6 and 2 times more B1 than the second one, while almond is significantly high in Vitamin B2 (more than 8 times) and Vitamin B3 (almost 3 times per 300gr). And it is important to mention that walnut is a good source of Vitamin K, whereas the other one is completely poor in this aspect. Walnuts are a perfect source of anti-inflammatory omega-3 and essential fatty acids. They are high in antioxidants, copper (even more than the other one), manganese, and vitamins of B group as so on. According to research, the nutritional benefits of walnuts are even more highlighted if consumed wholly (including the skin). It states that almost 90% of phenols like phenolic acids, tannins and flavonoids are found in the skin. Nevertheless, you may read in various sources that it is preferable to remove the whitish, waxy skin, but sometimes even bitter skin is a great source of useful elements. The cardiovascular benefits of walnuts have thoroughly been evaluated in various researches. They are trusted supporters of anti-inflammatory nutrients, proper blood composition and so on. These seeds are also perfect for reducing metabolic syndrome related issues. Their benefits in treating type 2 diabetes are amazing. A number of measurements are done on blood vessel functioning that showed that relatively small amounts of walnut intake may help people with type 2 diabetes. Thanks to a lot of antioxidant and anti-inflammatory nutrients these nuts are supposed to have anti-cancer benefits. Most of the evidence related to breast cancer is based on studies carried out on mice and rats. Now let’s smoothly pass to almonds and see what other health benefits we can have consuming these delicious seeds. It has become clear that this high-fat food is great for our health due to the wide area of effectiveness and usefulness. According to a recent study (British Journal of Nutrition, 2009) states that this fatty seed is able to reduce the level cholesterol and other LDL fractions during 2 weeks. Added to their cholesterol-lowering effects, they obtain the ability to reduce the risk of heart disease and it is partially done due to vitamin E. It goes without saying that almonds not only decrease after-meal rises in blood sugar, but also provide double-barreled protection against cardiovascular disease and diabetes. The best way to promote optimal health is eating whole foods, another new research argues. Therefore, this seed should be eaten with skin, which is rich in flavonoids and antioxidants. Having problems with weight loss is not a problem now, even if you are crazy about fatty food. International Journal of Obesity and Related Metabolic Disorders , here you may find the proof of my words, as the study published here states that almond-enriched diet can be helpful for overweight people. Thus, except for helping to lose weight, these almighty seeds also help people not to gain extra weight. Thus, in order to avoid cardiovascular diseases, obesity and maintaining healthy lifestyle daily consumption of almonds is recommended, as it may help to eat a healthier diet. Another study states that women eating at least 1 ounce of nuts per week lower their risk of developing gallstones by 25%. So, it becomes evidence that being healthy is not that difficult, so let’s accomplish that task with honor and never put our health at risk. As a conclusion, we should add that you had better give the priority to almonds, if you are concerned about the amounts of minerals like Copper, Iron, Magnesium, Phosphorus, Potassium and Calcium. Nevertheless, walnut is a wise choice when looking for a greater source of vitamins like E, K and B1, B2, B5, and B6. In addition, the latter is higher in calories and fats than the second one. From the other hand, almonds are a huge source of carbohydrates responsible for your daily energy. Thus, it’s up to you which one is better for you regarding the aspect of their usage and health issues you may consider.